The Catholic Courier and El Mensajero Católico won a total of 22 awards from the Catholic Press Association for work published in 2017. The CPA, which represents more than 600 Catholic publications in the United States and Canada, presented the awards during its annual convention June 12-15 in Green Bay, Wis.
• Photographer of the Year: Second place in this category went to Staff Photographer Jeff Witherow for a body of work from 2017. • Best Multimedia Package — Feature Package: Witherow and New Media Coordinator Gina Capellazzi took home first place for their multimedia project on the 2017 National Catholic Youth Conference. • Best Freestanding Presentation of Online Photo Gallery or Slide Show: Witherow and Staff Photographer John Haeger received a second-place award for their photos of Ash Wednesday services. “Excellent photography. Some intriguing stories. Very competent photography demonstrated throughout,” the judges wrote. • Best Photograph — Share the Journey: Witherow won second place for his photo of a rally in Rochester to protest President Donald Trump’s executive order on immigration and refugees. In the photo is a large banner noting that Rochester continues to be a sanctuary city. “Crowd and sign connect the concept of Sharing the Journey,” the judges noted. • Best Feature Writing — Non-Weekly Diocesan Newspaper, Circulation 25,001 or more: Staff Writer Mike Latona received a third-place award for his November 2017 story on four men who recounted their service during the Vietnam War. "A compelling story with a personal touch, allowing readers to connect because of the engaging lay out of information,” the judges wrote. 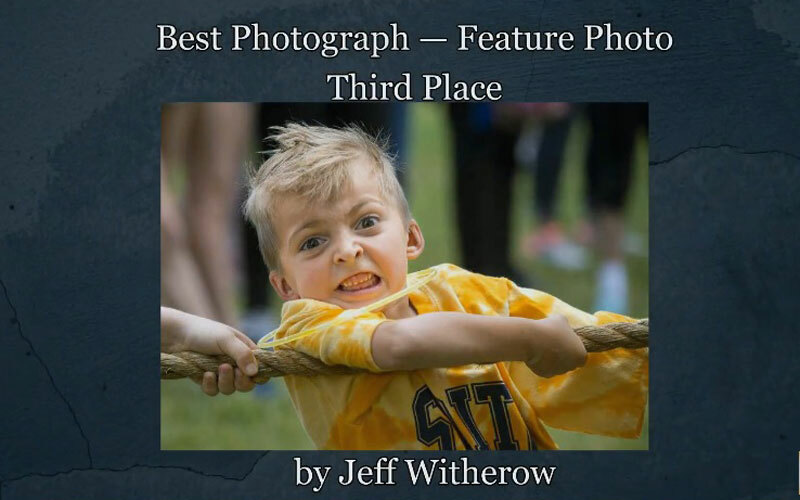 • Best Photograph — Best Feature Photo: Witherow took home a third-place award for his August 2017 photo of a first-grader participating in a tug-of-war contest during a field day event at Webster’s St. Rita School. “Tight is right! This certainly holds true for this image. Great lens choice by the photographer (and) patience waiting for the peak moment,” the judges said. • Best Blog — Publication Blog: Capellazzi, Latona, Staff Writer Annette Jiménez, Staff Writer Jennifer Burke and Assistant Editor Jennifer Ficcaglia received an honorable mention for their contributions to “Our Two Cents,” the Courier’s staff blog. • Best Use of Photos in Social Media: Witherow received an honorable mention for his photos of the 2017 National Catholic Youth Conference that were posted to the Courier’s Facebook page. • Spanish Staff Writer of the Year: Jiménez received third place in this category. • Spanish Publication of the Year: El Mensajero won first place in this category. “El Mensajero serves the Rochester community with a newspaper that, beyond coverage of issues relating to the faith (which it does with distinction), offers its readers the tools to lead an active, productive and effective civic life,” the judges commented. “I was particularly impressed by the articles focusing on the mayoral and school board races (this last one including miniprofiles of the candidates). The stories are well written, the pages beautifully designed. And after reading El Mensajero, Rochester readers have the tools to make major community choices. In its own way, it is an indispensable publication for Rochester’s Hispanic Community." • Best Front Page: Graphics Manager Matt Saxon won first place for a sampling of his front-page designs. “This is a great collection of front pages, distinguished by the wonderful use of photographs and a clean, consistent layout that is easy to follow and makes every issue familiar yet fresh and new,” the judges said. “There is also very good use of photography in the promo boxes." • Best Coverage of Violence in Our Communities: Jiménez won first place for her coverage of activists’ calls to overhaul the Rochester Police Department’s process of reviewing allegations of police abuse and a story of a Rochester man who was severely injured in a shooting in Ohio. • Best Reporting of Social Justice Issues — Dignity and the Rights of the Workers: Jiménez took home first place for her June 2017 story on immigrant advocates’ calls for better working conditions for dairy farmworkers. “Good use of data and secondary sources to discuss a thorny issue,” the judges said. “I really liked this article because it exposed me to an issue I had never really considered before (the plight of dairy farmworkers), while also framing their labor rights and concerns in a way that would allow me to compare it to other more familiar issues/careers. I live in the New York area and I consume Chobani regularly and this is a conflict I had never ever heard about. Overall the writing/grammar and storytelling is good. There is a strong mix of anecdotes, statistics, and references to specific organizations." • Best Use of Art or Graphics — Best Chart or Information Graphic: El Mensajero won first place for an information graphic that accompanied a story about the benefits and challenges of hiring millennials. It was published in February 2017’s “El Mural de la Comunidad” section, which is devoted to coverage of economic development in the Hispanic community. “This is a good effort to visualize the statistics in the story; the graphic is easy to read and nice to look at,” the judges said. • Best Online Spanish Presentation of Multimedia Visuals: Witherow received two awards in this category. He received first place for his February 2017 video about students at a Rochester school who learned about colonial America through the performing arts. “Great piece of video journalism. It is enjoyable on many levels,” the judges said. He also received a second-place award for his December 2017 video on a rally to support an immigration-rights leader. “Well-crafted story that covers all sides properly and in an unbiased manner,” the judges wrote. • Best Use of Photos in Social Media: Haeger received second place for his photos of a May 2017 Borinquen Dance Theatre performance. “Beautiful pictures that capture the motion and energy of dance. The photographer did a wonderful job of bringing the creativity of dance to the reader/viewer,” the judges said. • Best News Writing — Local/Regional Event: Jiménez won third place for a series of articles about how individuals and organizations in Rochester assisted Puerto Ricans in the wake of Hurricane Maria. “Good story focuses on community engagement, and with a proper call to action and feel good angles in the face of a tragedy,” the judges wrote. • Best Photograph: Witherow won two awards in this category. He received third place for his October 2017 photo of a woman and her son at a rally to demand congressional action on the Deferred Action for Childhood Arrivals (DACA) program. “There is a great deal to look at in this photograph—the relationship between (we assume) the mother and child; the relationship between the two and the flag. It brings the point clearly home,” the judges wrote. He also received an honorable mention for his photograph of a 7-year-old boy at a Hispanic Heritage Month event. • Best Reporting on the V Encuentro: Jiménez won third place for a series of articles on the V Encuentro. “These articles do a great job in explaining the nature and importance of the ‘Encuentro.’ The information is carefully presented. I liked the diversity in the subtopics of these 3 articles, even though they all revolve around the same theme. The article about the inmates involved in the program and how they benefitted from it is really unique and interesting. The writing is strong and there is ample detail given,” the judges wrote. • Best Multiple Picture Package: Witherow received an honorable mention for his August 2017 photos of a baseball game between local youth baseball leagues and a team of young people from the Dominican Republic.